The tone of Renya, who opened his mouth, was calm. Being somewhat scared by that on the contrary, Shion’s body cowers. For some reason Shion’s gaze spontaneously fell on the katana at Renya’s hips. 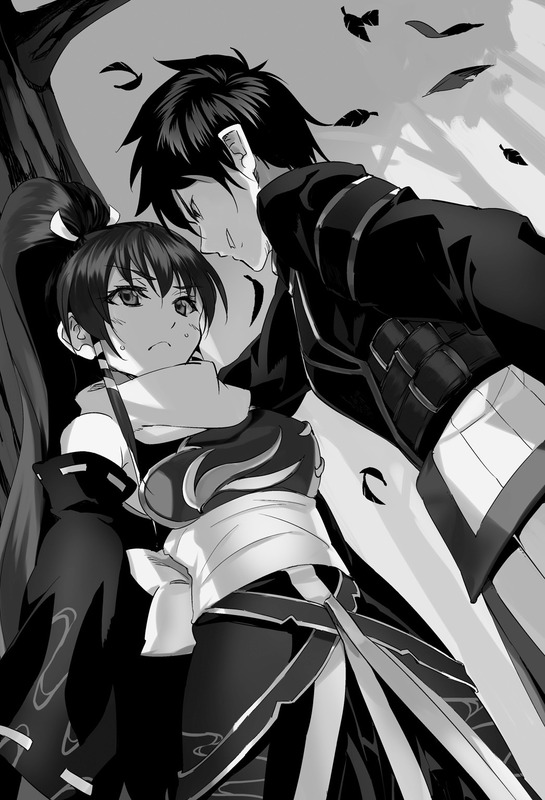 Noticing that gaze, Renya exhales slightly. There are no emotions in his voice. Shion nodded due to Renya’s tone, which was as if he was simply affirming it indifferently. Although it was only by a small degree, Renya’s gaze daunted Shion. His eyes were only slight narrowed down. It is just that, but Shion falls into a sensation similar to being drenched in cold water from the top of her head down to the tips of her feet. Shion frantically restrained the words “As expected, sorry, it was a lie, forget about it” which welled up in her throat. I didn’t believe that there would be a day when my own voice would sound this lifeless, Shion thinks. Even though we are in the midst of our escape, and even more so because those are the words of a hypocrite, Renya’s and Rona’s feet have stopped thanks to me. How dangerous that was in the current situation, even for Shion the excuse that she doesn’t understand didn’t exist. Even so, there’s a reason why she can’t pull back. Although it wasn’t like she was unable to speak about that reason, Shion couldn’t reach a decision whether it was fine to tell Renya or not. Once Shion glances in Rona’s direction, she sees Rona sinking into silence with a serious expression. Rona couldn’t avoid being on Shion’s side with half of her heart due to her position, but once she rationally considers with the other half of her heart that this proposal will expose Shion’s body to danger, Rona concludes that she doesn’t want to join her on that. Shion understands that somehow as well. Rona is feeling that she wants this proposal to be discarded and cut in one single stroke by Renya. In that situation Shion likely won’t have any other choice but to follow Renya is what she is supposed to be thinking. Although Shion has realized Rona train of thought, Shion is frustrated because the words to disprove that won’t appear. Of course, even if she revealed her own standing, the chances that Renya will get on with Shion’s proposal are almost non-existent. Shion comprehends that too. Nevertheless, in the present state, where I can’t say that I want to do it like this because of that, it’s inevitable for the words, I have said, to be considered the nonsense of an idiot by someone, who simply doesn’t understand my position. Though I don’t know whether that’s frustrating or vexing, Shion rebuked herself, who’s close to weeping, to not screw around. Since I will be just an idiot, if I cry here, my rank will fall even lower to that of a stupid girl, who appeals to a man by relying on her tears. I want him to at least understand that I have spoken seriously. Hoping for only that, Shion fixes her eyes on Renya. In contrast to that, Renya was pondering about something totally different from what Shion has imagined. Voicing it out clearly, the Shion, seen by Renya, is no more than a naive ojou-san, who throws tantrums with her flower-field-like way of thinking within her head. She isn’t even able to assess the situation. For some reason she shows resistance to completely abandon other people. It’s not particularly a problem of hypocrisy. Certainly, that little girl, who sent me to this world, shouldn’t even reach the worth of being dirt under Shion’s nails. And so the current situation was an event within Renya’s range of prediction. That’s why Renya is considering it like this. I planned to escape by hopping onto the momentum of the situation before Shion realizes the necessity of investigation and the possibility of rescue, but that didn’t go too well, Renya clicks his tongue lightly. Now that she realized it, there were two choices, Renya could make. One, to refuse it curtly and discard it. Even if Rona sided with Shion, they wouldn’t be able to investigate and help with only the two of them. At best it will only become a second and third repetition of the killed female adventurer, who was bitten and torn from inside by the something from before. Two, to agree with Shion’s proposal. Renya didn’t happen to have even the slightest attitude of considering himself to be amazing, but even so, if he accompanied those two, he had the confidence that they at least would be able to walk around without dying. However, somehow that’s not like me at all, is the sentiment Renya has. In the first place, there’s no reason that I must do it, even if I’m able to, in the current situation. I’m really not cut out for such setting‘, he leaks a sigh. If I were a protagonist in a fairy-tale, it would be a setting, where I pick up my sword in high spirits due to the request by a beautiful maiden, but it’s not like I can do something this ridiculous, Renya ended up judging and felt just a bit lonely. Even if I judge it like that, since I’m simply not able to do something I’m not able to, a behaviour like that, similar to a cool protagonist, should be left to people, who are able to do it. I have to ponder how I should act and proceed from here on, Renya decides. In fact the choice of refusing Shion’s request had been eliminated by Renya from the very beginning. If you look for reasons, there are many, however the biggest reason is that in the same way as Shion is relying on Renya, there are also parts, where Renya relies on Shion. That means that Renya has acknowledged that point by himself. Renya has no relation with anyone from anywhere in this world. That’s an extremely miserable story, Renya always thought. It might be seen as cool, if you write it off as another world transfer, but the position, Renya has been placed in, is ultimately nothing more than being a plain loner. Although his body has the age of 18 years, it’s not like he passed those 18 years living in this world. There isn’t a single person, who has a blood relationship to him, either. His insides are those of a 94 years old, but the memories and relationships of those 94 years were from the environment of his previous life. In other words, no matter how you look at it, the existence called Kunugi Renya is nothing more than a foreign body in regards to this world. He was saved from that concept to some degree by the two beings called Rona and Shion. In addition to that, he began to form bonds to a maid-san and friends here and there, too, but the ones, who extended a helping hand towards Renya, unbeknownst whether they could become comrades, were those two. Of course, their self-interest in the act of lending a helping hand can’t be helped since humans are calculative like that. The ones who demand something with no compensation from a stranger are called greedy. Besides, Renya thinks while reflecting upon his slightly shameful desires. if I ended up laughing at Shion’s matter as the utter foolishness of a teenager although it’s only the naivety of thinking, as it’s not accompanied by true strength, what will become of me, I wonder? At any rate, being moved by the words of that little girl “If you don’t go, many people will die due to the collapsing world”, I’m an extremely foolish guy, who ended up crossing the boundary for the sake of protecting those lives and the world, I have absolutely no relation with. Although I, who became a Lost for such reason, can’t give a motive, there’s no way that I’m able to refuse this matter by laughing at Shion, who has appealed that we cannot afford to run away while overlooking things like this. Shion mutters while trying to take a peek at the face of Renya, who ended up brooding. Immersing himself within his thoughts, Renya noticed her look, breathed out once as if troubled and looked up the sky with his arms folded. Somehow I want to really smoke a cigarette, Renya thought. I don’t know whether I smoked in my previous life. I also don’t know whether it might be fine to smoke a cigarette in the world over here with the age of this body. In the first place, I don’t even know whether there is something called tobacco in this world, however it is after all better to release cigarette smoke than breathing a sigh, is what he felt like. It has been often enough said that it’s doing no good and a lot of harm, but since tobacco has an effect of stabilizing the mind, it has at least one advantage, I guess, Renya believes. And currently Renya strongly desired that effect of stabilizing the mind. Renya says while still looking up to the sky. He absolutely didn’t feel like he could talk in his usual tone, if he looked at the faces of Shion and Rona. Without even seeing, Renya could imagine what kind of face Shion and Rona are making. Surely Rona has an expression as if she has encountered a ghost on a street in the night. Shion is probably making a face as if she is swinging her tail, if she had one, with all power while doing her best as puppy, who received her feed. Shion raises her voice making a complete turn towards dissatisfaction. She doesn’t understand my feelings either. Probably, by not adopting all of Shion’s opinion, she is likely presuming that Renya is talking as if dropping it at halfway. However, this aspect is a part that can’t be conceded, even for Renya. He is unable to expose acquaintances to danger for the sake of strangers. Renya argues vehemently with Shion, who is unable to object, only at the critical moments. At any rate, Renya had the notion that it will be no good to give Shion the time to object or to think about it. Once Renya declare so and brings his face close without hesitation, Shion, who lost to his intensity, nods unintentionally. “I took this as promise”, while making a triumphant pose within his mind, Renya issues instructions before Shion can say anything unnecessary. Once Shion nods, Renya, who claps the back of Rona, who intently watched the situation, begins to move once again aiming for the outside of the forest. Even if Shion and Rona, who are nothing but mere members, suddenly tried requesting the formation of something like a subjugation unit, it would be very difficult to imagine the top brass of the guild to immediately move to deal with that. However, that’s only the case if Shion and Rona are truly simple adventurers. Renya doesn’t know the details about Shion’s side, but he has experienced that at least Rona should have a method to force her opinion through since she is a knight. As expected by Renya, Rona simply nodded. “You are quick-witted only at pointless places”, Renya curses taking care that it’s not audible. He cannot afford exposing people, he became acquainted with, to danger for the sake of strangers. By his own judgement, the one, who is fine to be exposed to danger for the sake of strangers, is only the one who made that call. The surprised Shion tried to stop that due to Renya’s statement, but Renya interrupted her words in the middle. Shion, who attempted to say something, held back. Renya smiled at Shion, who is looking at Renya while running in front. It will be great if Shion’s way of thinking changes a bit with this, while hoping that, Renya cracked a joke wondering whether he is too pathetic for being intimidated as well. That was a harsh move from Rental, but I hope Shion grows up from it. that is one heck of an internal monologue! good job on that! Hope Shion will realise that sometimes trying to help will only increase the victims. The same old MC logic: “This is a stupid situation that could get me killed and I know it, but I’m gonna do it anyway because a girl asked me to.” I wish authors would skip over trying to make their MCs appear smart, reasonable, and relatable in these situations only to then defy their own logic out of good will, because it’s not relatable and it’s annoying. Sorry for the rant, but it’s just become one of my pet peeves: If you’re gonna do it, just do it instead of going through a soliloquy about how you’re gonna defy your own logic to show what a good person you are. It’s literally more annoying than the guy who always screams before a sneak attack. I dont understand your complaint. In the 1st place, Renya is not acting because he feel wanting to do it or a false sense of justice or righteousness. he do it because his woman ask him the unreasonable and this was him, grumbling in his own mind about it. If you think you can get a man to do the unreasonable, without being aware of its unreasoness, and expect him to not grumble you are a prepubescent girl. Any person would complain in this situation, that’s not what I’m irritated with, it’s the fact that he goes on and on about the situation in his head in a way that implies that he’s complaining more about the situation than he is assessing it. If he was spending all of that time assessing how he was going to deal with the situation, it would have been fine. But as he says himself, he already had NO INTENTION of denying her request in the first place, so he should have already resigned himself to it and moved on. But as I said before, he goes over the situation in a way that shows he’s still complaining about it like he doesn’t want to do it and intends to run. The most he should’ve spent complaining should’ve been around 2 paragraphs at most because down his current line of decision making, any more is just a waste of time, energy, and brain power he should be using to deal with the unknown deadly BIOHAZARD that he’s going to have to fight in a forest at night. TL;DR: It’s fine to complain, but to someone who’s already resolved themselves to fight some deadly threat like he says he has, they’d be more concerned with planning, acting to survive, and have spent very little time complaining for as long as he does. And read his lines again, the majority is complaining. The nuance is subtle, but when you notice it, it stands out. And a lot of authors do this when their MC meets unreasonable situations. The complaining gets to the point where it becomes out of character and appears petty. However, if the MC is known to always complain (think Shikamaru from Naruto) then this would be fine. That’s not the case here though. Oh my god, renya is annoyingly tsundere. Neither agreeing not disagreeing, but thanks for the laugh. Hey enjoyed the chapter and agree with you she is definatly adventurer rank F strength. Although MC is rank F is power is more like A or S rank. Glad he told her off by going out to try rescue more likely others will die trying to protect her. I feel there was some growth with Shion compared to how she reacted in the 1st dugenon. Next button broken. Just wanted to let you know.